When I first started doing Svaroopa® yoga poses, I hated Lunge. Now it’s my cure-all for life. I use it for every ache and ailment. I do Lunge when I’m not feeling well and when I’m grouchy. I actually began Svaroopa® yoga with individual Embodyment® sessions and vichara (guided self-inquiry). Later, for a home practice, I relied on recorded guidance to do Four on the Floor. I avoided Lunge — the third pose in the sequence — I just lay in Shavasana instead. When I attended an asana class, naturally, I would have to do a Lunge. It did get easier with repeated classes. Then I took the Foundations of Svaroopa® Yoga course, and everything changed. I found a love for Lunge. Because Foundations is a five-day introductory teacher training, you learn to teach the primary poses to others. Thus, you stay in poses longer and learn more about alignments and propping. That’s when Lunge became my favorite pose. With extra support to meet my personal needs, I was able to relax into the pose. Then I could feel its benefits profoundly. My legs and spine expanded. And expansion spread into my heart and mind. While I did not take Foundations in order to teach, the program was hugely beneficial to me. I experienced profound opening. I learned to prop myself in my home practice more effectively. My feelings for Lunge morphed into love. Overall, I experienced more deeply the transformative effects of releasing spinal tension. And I learned more about the importance of precise alignment and customized propping to meet my individual tensions. Lunge as well as other poses in my home practice are delightful now. It’s amazing to have such reliable tools for living life to the fullest. This entry was posted in Ashram News on March 5, 2019 by Svaroopa Vidya Ashram. l consider myself the queen of self-care. I can’t remember the last time I needed to take a sick day. Doing my practices keeps my immune system strong, my spine flexible. My spirits stay uplifted and steady. Ujjayi Pranayama, meditation, chanting and asana start my morning. I offer seva, repeat mantra and try to remember my Guru throughout each day. A lot is going on in my life. My husband is retiring, and we are putting our house on the market. I’m teaching my classes, travelling and teaching for the Ashram. I am seeing clients, leading satsangs, writing blogs, etc. Endings, beginnings and maintenance — it’s all Shiva dancing through form and beyond form. Yet it is so easy to give into my distracted mind’s demands. I’m in hurry. I forget that all is Shiva, being me. I find myself doing my “wonder woman yogi” routine. Then it’s time to stop and assess the condition of my body and mind. Just today, a yoga buddy could hear the anxiety in my voice. So, together, we stopped everything and took a few slow, long, easy Ujjayi breaths. The space between us filled in with Self. The sound of my breath got me out of my head and into my body. The space within me filled with my essence and expanded. It opened me to the still center within. Shiva! Swamiji describes that “you hold your breath so you won’t feel the feelings that are surfacing or are just below the surface.” Until I read this, I had no idea it could be happening to me. The truth is, I am experiencing a major life transition. I am trying to dial down the accompanying emotions and dramas. There are, however, some big feelings to feel, not to repress! Doing a minute of Ujjayi breathing re-centers me. Divine Essence fills me. Nothing outside is so urgent. Perspective returns. It was just the mind, after all. When I feel thrown into the deep end, I don’t have to flail my arms. I don’t even have to swim. I can breathe, listen to my breath’s sweet sound and soften. Then I float in Guru’s Grace. This entry was posted in Ashram News on February 26, 2019 by Svaroopa Vidya Ashram. I confused seva with volunteering. I know now, however, that seva is yoga because it puts me in my stuff. That inner experience triggers spiritual growth. In volunteering, I just focused on getting the job done. In offering seva, I look at the effects of the process on me. I used to say I work better under pressure. Then I realized I only worked under pressure. Seva has helped me change that. My first seva involved updating contact information. The three-part process included calling, emailing and finally sending snail mail. I learned a bit about how to navigate an online communications system. All the while, I had to push myself through resistance and a deeply engrained habit of procrastination. I kept telling myself it was seva. You just do it. Humbly. In my case, grumbly. Liberation came in the form of my next seva: transcribing Swamiji’s recorded talks. Heaven. I actually asked Swamiji if it was still seva if I enjoyed it. Thus, I was treated to one of her wholehearted laughs. I was confusing seva with tapas. I loved that this new seva took information from my ears to my fingers and then to my eyes to review what I had transcribed. It required a lot of going back and listening again and again. How sweet that was. But nothing lasts. We transcribers were far ahead of the editors. So, then, I was asked to do editing. I confessed up front that editing was not my best skill set. Yet I stuck it out for a time. I got books for help but was not effectively contributing to the final product. Still, this seva was full of the Grace of revelation. It threw me into some very old stuff from school days. I recognized that gap couldn’t be closed and other sevites had that skill. I was able to release the editing seva without my small-s self being devastated. My current sevas include labeling and organizing our photos in an online app. I also send letters to non-cash donors, providing documentation for tax purposes, and I send notes to honorees who have been named in cash donations. Through seva I’ve learned to recognize old identities and bad habits I need to shed. I’ve learned humility in doing what I am told when I don’t want to. I’ve learned to trust in a process I don’t fully understand. I have cultivated willingness to learn new things and the capacity to step out of my comfort zone. Doing seva is doing more yoga; doing more yoga reveals our true Divinity. In the meantime, it gets stuff done. How great is that! This entry was posted in Ashram News on February 19, 2019 by Svaroopa Vidya Ashram. “The best part of the Yoga Therapy Intensive Retreat is that I do not feel rushed,” declares Evy (Kalyani) Zavolas. “Delicious downtime and rest allow my body and mind to integrate the therapeutic benefits. I experience inner renewal.” Since it was first offered, Kalyani has taken this healing retreat four times. Early morning includes chanting with Swami Nirmalananda or a yoga class before meditation . After a leisurely breakfast, you receive Yoga Therapy or a vichara (guided self-inquiry) session. The Ashram yoga therapists customize your sessions to your particular needs. Afternoons feature talks about the yogic healing process along with another private therapy session, and you chant and meditate before bed. Kalyani also appreciates that the retreat has no prerequisites for enrollment. It’s open to everyone, whether experienced yogi or non-practitioner. Kalyani has been doing Svaroopa® yoga and teaching for 19 years. This entry was posted in Ashram News on February 12, 2019 by Svaroopa Vidya Ashram. 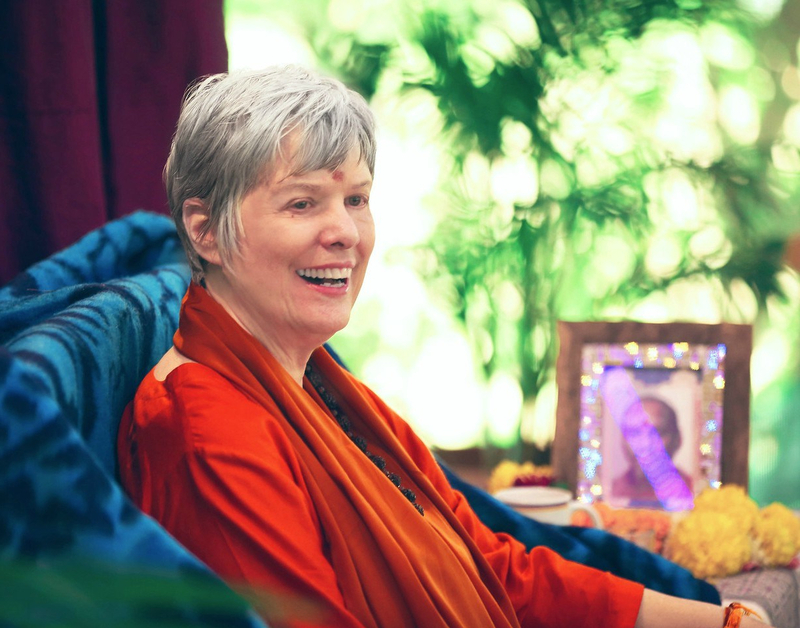 Even before Foundations, Rose listened to Swamiji’s recordings while commuting. She drives 30 minutes to and from the school where she teaches 6th graders. Listening to the recordings was an excellent way to continue learning more from Swami. She also found it a good way to deal with the stress of the commute. “It helped me feel more stable while driving,” Rose describes. “I can listen to something much more enriching than the daily news, which could stress me out, and more enriching than whatever music pops up on the radio. Then, when I listen at home, I have a notepad in front of me and jot down things that stand out. Sometimes I draw a picture to interact with the talk a little more.” Whether in her car or at home, listening to the audio recordings keeps Rose’s Lokananda Foundations experience fresh and alive. It keeps her closer to Swami. Listening to those recordings also keeps her rooted in the teachings that she cherishes as nourishment for her spiritual life.